When I first encouraged South Building colleagues to develop and annually update the accompanying chart, we could not anticipate how Carolina’s principal funding sources would change over time. The growth to a combined total of$1.2 billion from $486.5 million over 15 years is impressive. This shared partnership of taxpayers and students, faculty, alumni and friends is unparalleled. The escalating costs of research equipment and talent needed, particularly in the sciences, threaten the viability of many research universities. The University of Virginia today receives only 8 percent of its annual operating budget from state appropriations, prompting UVa, William & Mary and Virginia Tech to request to be designated “charter” universities. If granted, they would be permitted to set their own tuition and be freed of many state regulations. The University of Colorado, where 9 percent of the budget comes from Colorado taxpayers, recently was granted “enterprise status;’ meaning it no longer will be governed as other state agencies are. 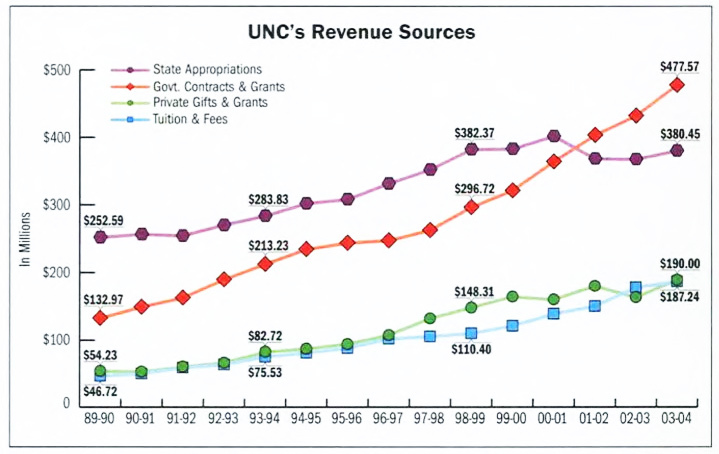 This chart affirms what Gene Nichol, dean of UNC’s law school, has claimed for some time— that “Carolina remains proudly public.” Over the past 15 years, despite two economic downturns, state appropriations have grown an average of 3.1 percent a year, and the $380.45 million in state appropriations for 2003-04 represented the income from an $8 billion endowment. Most impressive has been the growth in grants and contracts — 9.6 percent a year, which today represents 126 percent of state appropriations. But as competition increases and federal funding plateaus, that growth may be challenged. Tony Waldrop ’74, UNC’s vice chancellor for research and economic development, has suggested that Carolina’s greatest opportunity for growth in research funding is from corporations. In that area, UNC is ranked 90th ($75.4 million in 2003-04); Duke is ranked first, and N.C State is 15th. Alumni and friends, as during the Bicentennial Campaign, have been generous to the Carolina First campaign. Private gifts have grown at an annual rate of 9.8 percent over the past 15 years, today equaling nearly 50 percent of state appropriations. Similar growth has occurred in tuition and fees, at 10.5 percent a year; they now total slightly more than 49 percent of state appropriations. The special partnership among taxpayers and students, faculty, alumni and friends has built our University. That partnership also sustains its excellence as together we continue our quest to become America’s leading public university.